Hmmm . . . this is another topic that's tough making a single pick for because there are so many to choose from . . . . I feel like I need to go with a Fred and George moment here, so I'm picking the Weasley twins sprouting beards after trying to outsmart Dumbledore's Age Line in Goblet of Fire. They were so confident that they had accomplished their goal, which only made it funnier when they learned that they had not, in fact, succeeded. I was thinking of choosing the swamp, too! That is one of my favorite moments EVER from the entire series, but I picked it for a different HPMotW, so I figured I'd choose something else involving the twins. And there were still plenty of Fred and George moments to choose from, lol. I loved how sure they were of themselves, only to be proven so, so wrong! Dumbledore probably made the Age Line specifically Fred and George proof! I love this part! Seeing the beards sprout in the movie was a lot of fun, but I was a bit disappointed with their reaction. Grappling instead of joking about it like they did in the book. Excellent choice :D That part is always funny! Jaclyn @ JC's Book Haven. 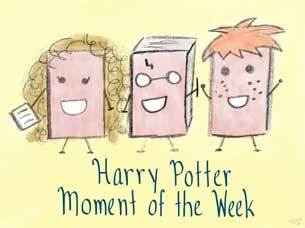 Goblet of Fire definitely needed some humorous moments to counter the darker ones, especially toward the end of the book. And the twins could always be counted on to deliver them, like they did with their "ingenius" plan to get their names in the Goblet!